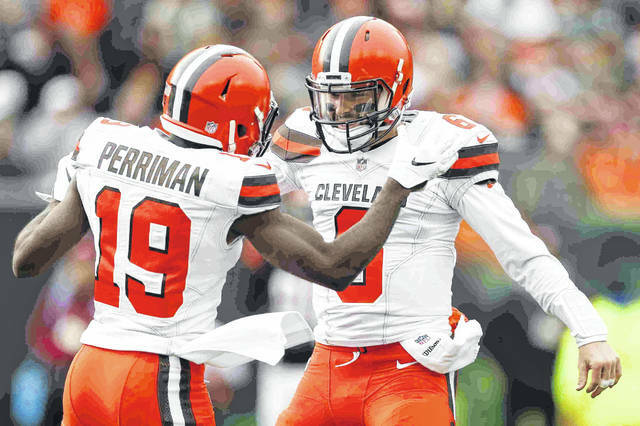 CINCINNATI (AP) — Baker Mayfield threw a career-high four touchdown passes in another growing-up-fast performance, and the Cleveland Browns ended one of the NFL’s longest streaks of road futility on Sunday with a 35-20 victory over the Cincinnati Bengals, who lost quarterback Andy Dalton to a thumb injury. Cleveland (4-6-1) got its first road win since 2015, emphatically snapping a streak of 25 straight road losses that was one shy of the Lions’ NFL record. The Browns also ended a run of seven straight losses to their intrastate rival. And just as the Browns’ unabashed safety had predicted, it wasn’t even close. The Browns surged ahead 28-0 as former head coach Hue Jackson watched helplessly from the opposite sideline. Jackson couldn’t win with the Browns — only three victories in two-plus seasons. Nor could he beat them as a special defensive assistant with the Bengals (5-6), who lost for the fifth time in six games. Seeing their former coach on the other sideline added to the Browns’ motivation. “Somebody who was in our locker room is asking us to play for him, and then he goes to a different team,” said Mayfield, who didn’t feel like talking to Jackson when they met on the field after the game. Randall had predicted during the week that if Bengals receiver A.J. Green didn’t play, the Browns would dominate. Green was out again with a toe injury, and Randall had a hand in making his prediction hold up. “He just said thank you for the ball,” Randall said. Dalton hurt the thumb on his passing hand while trying to recover a fumble in the third quarter and didn’t return. He was still being evaluated after the game. The Browns turned the fumble recovery into Mayfield’s fourth TD pass for a 35-7 lead. Dalton was 10 of 17 for 100 yards with a touchdown and an interception. From the opening drive, it was all Cleveland. The Browns’ 28 first-half points were their most since 1991, when they scored 31 against the Colts. Mayfield was at the center of it all, completing 14 of 18 passes as the Browns surged ahead by 21 points. He was coming off his best game, a three-TD performance during a 28-16 win over Atlanta that sent Cleveland into its bye week. Mayfield finished 19 of 26 for 258 yards as the Browns essentially ran out the clock in the second half — he threw only four passes in the second half. The first half reminded him of his free-wheeling games at Oklahoma. Cleveland running back Nick Chubb had another big day, running 1 yard for a touchdown and catching a 14-yard TD pass over Brandon Wilson. He’s the third rookie in NFL history to have a rushing and a receiving TD in two consecutive games. Browns: Cleveland came out of its bye week as healthy as it’s been all season. Bengals: CB Dre Kirkpatrick also was inactive with shoulder injury. OL Cordy Glenn was out with a back injury, and fill-in Jake Fisher hurt his back late in the first half. CB Tony McRae suffered a concussion in the third quarter and gave two thumbs-up as he was wheeled off the field.